Patrons of the annual Old Settler’s Day in Kirwin were better able to hear the events thanks to a Hansen Foundation grant for sound equipment. 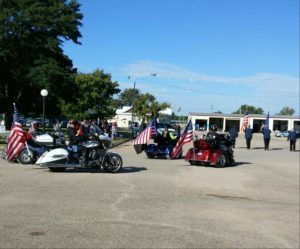 About 250 local residents and out of town guests enjoyed the parade, children’s games, local talent play, horse show and nearly 850 attended the demolition derby. The event has been held since 1931. It began as a day of speeches and morphed into the events offered today. Many generations of Kirwinites have participated and built floats for the parade or become actors for the local talent plays.